Kids are natural artists. They love to paint and draw, they love to explore and experiment with all the colors and textures… basically, they love to create art. And yet, art programs are being cut at most public schools all the time. I would like to change that. I would love to bring some of the art back to the schools, where it belongs. Last year I started publishing a digital art magazine for kids. It is called arTree and it combines art history with art education. 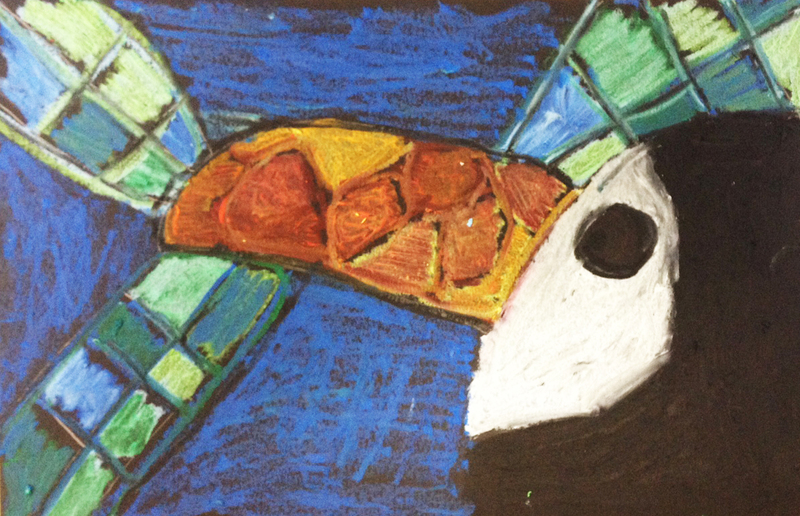 It teaches kids about perspective, color theory, shading, blending and much more. It introduces current artists in special interviews and connects art with Math, science, physical activities and storytelling. It is a digital magazine that comes out every month with 14 – 18 pages of art. I started publishing the magazine because I thought it was missing on the market. There are magazines about animals, pop culture and some magazines just for girls but I could not find a magazine about art. And my son loves art. He doesn’t just like it, he loves it. When he was three years old he would spend hours drawing pictures for his friends. And I would spend hours and hours on Pinterest preparing some fun projects and activities for him to keep him challenged and busy. It was exhausting, but really fun. In the fall my son started attending Woodside Elementary. The school seemed like a wonderful place for him with one little problem – there was almost no art. There were a couple of dedicated moms who brought their own ideas and supplies to the classrooms but they could not more than a couple of classrooms. I decided to change that. Some of those wonderful PTA moms and I decided to take arTree and use it as our lesson plans for the following year. Today, couple of months later, there are over 700 kids involved in the art docent program at Woodside. They all have free access to the magazine and they all make one or two of the arTree projects during their art docent lessons each month. In the first months some of the teachers were reluctant to share the valuable time with the parents, but now, they all have spots for their art docents in the schedules. Even the principal, Dr. Betty Cobbs, called it the best running art docent program she ever had in any of her schools. And of course the kids have learned a lot. They have learned about one-point and atmospheric perspective, they have made collages and drew with oil pastels, they designed their dream houses with watercolors and learned about minimal realism with potato stamps. The art docents have a wonderful time as well. Every month we do an art docent training. Basically, it is a time when all of the moms meet, learn about the new project and make some wonderful art together. Everybody loves it! It’s like a ‘sip and paint’ – without the wine. In the last couple of months I have started developing more and more art projects and presentations for the art docents to use. And now, I am adding a whole new visual arts program to the arTree magazine and I am starting to look for more schools that would like to adopt the program. Getting art to kids is my primary goal so I am keeping the program in the digital format. It allows me to keep the price down and get the magazine to all kids at the school for free. Some of the competitors sell their lesson plans for $200 per class which I think is very steep for some of the schools in the area. I provide the lessons for the whole year, the magazine and a list of materials for $250 per year – for the whole school. 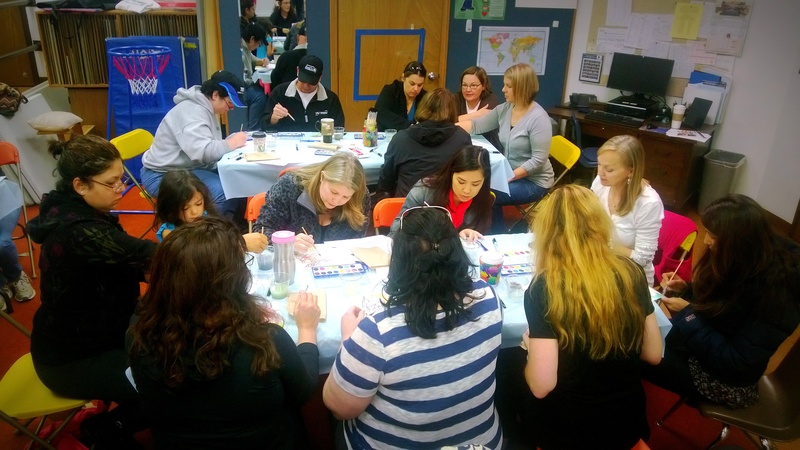 The program aligns with WA Arts K 1-12 learning standards and it makes it super easy for parents who have not painted since they were kids to get involved in the program. Plus, I help schools raise money for the supplies. I give them all two lesson plans for after-school art classes that they can run themselves to get all the art-docent-supply money they need. I love art. I love teaching it and I would love to share that experience with others. It is very rewarding when you walk around the school and the kids greet you excitedly with: “do we do art today?” Art docent program is a wonderful thing and arTree makes it easy for everyone to get involved. You do not have to be an artist to teach a lesson. You just need to be passionate and love what you do. The kids will do the rest. Do you want to bring this program to your school? If you contact me (info@artreekids.com) by 5/25 and mention the code: artDocent514 you will be able to bring the whole program to your school for only $125/year! This entry was posted in Uncategorized and tagged art, ArTree, children, docent, kids, parents, program, PTA, pto, ptsa, school, woodside. Bookmark the permalink.